"A doctor of medicine?" "Well, medicine, science, engineering, candyfloss, Lego, philosophy, music, problems, people... hope. Mostly hope." TECHNICAL SPECS: First aired Nov.4 2018. IN THIS ONE... The Doctor is on a medical ship that's being eaten by a gremlin-like creature. REVIEW: I had to double-check that The Tsuranga Conundrum was written by Chris Chibnall, because its compact guest cast and environment, and its relative lack of character development for the main cast, made me think it was an easily-ignored one-off. Aside from a few biographical details (how Ryan's mom died), it is quite unnecessary, and even feels like a spec script, with the 13th Doctor coming off sounding a bit like the 10th ("Snap", etc.) and the companions there to comment, often with glib zingers, while catering to the stories of the guest stars. It's an unfortunate step back for a version of the show that, despite its plotting problems, has had strong character moments throughout. 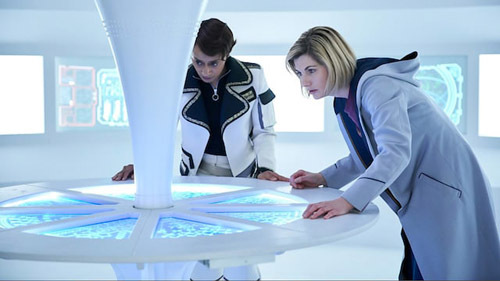 Even the striking look of the white spaceship interiors feels quote apart from the location-heavy Series 11. Let's talk plot holes, since the show is determined to fly a hospital ship through a series of them. The biggest, for me, is the Doctor's mysterious abdominal pain. The medic is really worried about it, and she holds her side through most of the episode, and then it's forgotten. I guess its function was only to make the Doctor make early mistakes because she can think straight, but none of the companions had any real sequels to being hit by a sonic mine. And why no attempt to at least take cover? Now consider the Pting. I don't think I want to debate whether "cute" was a good or bad idea, and as an effect, it was fairly well realized, if cartoonish (especially the way it eats things bigger than itself). But I'm afraid the big reveal about its diet isn't much of one, and I don't like how far ahead of the Doctor I was on that. I eats a hell of a lot of junk metal for something that actually feeds on energy. Don't people radiate more energy than a metal pipe? How about the android? Immune to the Pting's toxic skin, but still registers as inedible? While we're on the topic of Ronan, it feels like his automatic deactivation should be more of a plot point, perhaps have the Doctor or Durkas somehow disable the failsafe as a reward, or just because it's the right thing to do for an obviously sentient being. I understand they might have blown the budget early on this one, but it still leaves a lot to be desired that we don't get exterior shots of the ship navigating the asteroid field, as it downplays Eve's brave act substantially. The sonic is eaten, but just drained (unlike everything else), and then "cleverly" reboots, which shouldn't surprise the Doctor since she built it herself. There's a lot of urgency in the episode, but it doesn't cover up all the problems. A lot of our interest hinges on whether or not we invest in the Tsuranga's inhabitants. Some are useful to the plot, i.e. have abilities the Doctor will harness to save all their lives (all but one, Astos' function was to die early and leave the ship in unsure hands). Mabli is nominally in charge and the required medic. Durkas can take the ship off automatic. Eve can pilot it at great risk to her health. Not too sure Ronan was that useful, except to keep Yaz company. And then Yoss, the pregnant boy, is more of a complication, just another damn thing that has to be taken care of when it all goes wrong. At least he speaks to Ryan's drama. Yoss thinks of giving up his unplanned baby, and Ryan makes it his mission to make him "present" as a father, the way his own dad was never there for him. There's some poignancy in that. But otherwise, do we care much? About whether or not Yoss keeps the baby, Eve dies from Pilot's Heart, she and Durkas are reconciled, Ronan is accepted as her consort, or Mabli finds her confidence? I dunno. It feels like we lost the most interesting character of the bunch early - Astos was calling out the Doctor left and right, and that was a richer relationship by far than anything else we get. So as usual, it's up to the main cast to bring a problematic episode from the brink. The Doctor's jokes land better than usual, I think. The Poirot bit. "I thought there'd be more questions." Having Yaz pick a number. The Hamilton stuff. Listing off her doctorates. Still espousing the educational mandate of the Hartnell era, she's quick to explain antimatter, but also expresses wonder. There's a real positivity in this and what she has to say about hope that really typifies this Doctor. BUT Chibnall still saddles her with a lot of exposition, not all of it necessary. Yaz is likewise hampered. In addition to STILL not having had a scene with Graham, she contributes 21st-Century analogies for things in the future, in case we don't get it. At least she gets a bit of action and an emotional scene with Ryan, but Chibnall has to find more for her to do than act as Ryan's emotional anchor. This is also a rather poor episode for Graham, who's quick with the zingers, but isn't asked to show as much range as in previous episodes. Again, Chibnall falls back on things we've already seen - talking about Grace's possible reactions, offering a fist bump that Ryan denies... I thought we were past this. But while he's on a futuristic hospital ship, not even a question about his cancer? It's like the characters are visiting someone else's show and are written as their series bible selves. REWATCHABILITY: Medium - And I struggled with giving it this high a score (all the more upsetting for this being my thousandth Doctor Who review), but ultimately, there are some funny lines and it's watchable. It just feels like a step back from the character-driven drama we've had to date. Funnily, I got a real sense of Doc 10's influence here too. Like a family resemblance. Hopefully Disney doesn't notice the Pting's resemblance to experiment 626... Stitch, or at least one of his 625 forebears. I love three things showing as a pattern in all of the episodes so far... each episode has an important social lesson, not just entertainment. Each episode explores more about what a family is. Each episode has had an educational spiel from the doctor about history or science. Parents have been complaining about how telly turns their kids brains to mush, but no longer: Doctor Who is a valid resource, handy to anyone doing a bit of growing up. It'll have an impact on building better people. I've certainly learned a thing or two from it this season. "she's quick to explain antimatter..."
I'd argue against the "quick" there. To be honest, I'm not sure how I felt about that. I'm all for educational content, but it was really weird to stop the episode for over a minute while the Doctor raved about anti-matter. Any why now? She's two thousand years old! She's seen a lot of starship engines! It seemed a weird time to start raving about how good they are, especially since there's no indication that this one is anything out of the ordinary. Point and counterpoint, gentlemen. Well done. Why now is because she's seeing everything through new eyes/perspective, and on a meta level, because I think Chibnall is deliberately trying to channel the show's original educational remit. She's "quick" to want to talk about, not quick to get through it, but I've seen a lot of people say they liked this moment and how the Doctor can still (newly?) be wowed by things. But I'm with you on the plot problems, Liam, 100%. I should make it clear that I'm not against the speech. I just found it a bit odd. It'd be a bit like if she started raving about the internal combustion engine just because someone gave her a drive in a bog standard car. It's the difference between "can we have the lights on?" when driving in a police car and "can we adjust the wing mirrors?" in a regular car. Also, exactly how much did Yaz learn about antimatter during GCSE Physics? I say Police Academy training in a Doctor Who universe. There's an extension course for those who might be in UNIT some day. I am a simple creature, and basically I am happy if the Doctor and her retinue kept my interest. They did. Hahahahaaa! You guys are great. ...Lilo and Stitch. I bet Stitch came from Pting stock originally. Here he eats a fluffy puppy, but some of his cousins/brothers ate metal, electricity, anything you like. Just hopping back to the antimatter explanation... I bet there's a dash of irony in the delivery, because there's no way the casual observer can understand the explanation without the rewind button. This sort of thing IS, on the other hand, MUCH more common in written sci-fi. That's what makes it "scientific fiction" after all. Was it just my English teacher, or did you guys all get fed the "if it doesn't teach you something then it's not sci-fi" line as well? There's also Futurama's Nibler, as a possible precursor. I had to look HIM up on youtube! I also reckon our Pting's movements were reminiscent of the "Minions." Pting was fun. On youtube I remember seeing fan-made Jarjar lampoons, I wonder if Pting will take on a 3D Fanimated life too?